The educational institutions covered by this provision are not only the Government institutions of higher education but all those higher education institutions which are receiving aid from the Government. 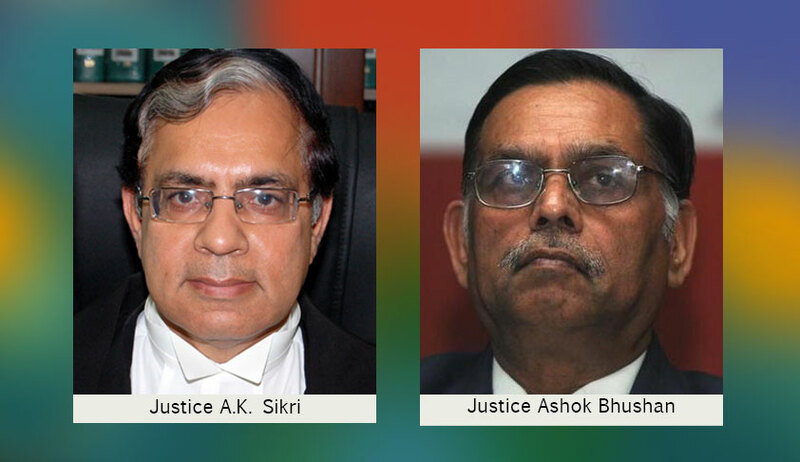 A bench of Justice AK Sikri and Justice Ashok Bhushan ordered, “…we direct that all those institutions which are covered by the obligations provided under Section 32 of the Disabilities Act, 2016 shall comply with the provisions of Section 32 while making admission of students in educational courses of higher education each year. The apex court order comes on an 11-year-old petition titled Disabled Rights Group & Anr vs Union of India & Ors. Which had raised the issue of non-implementation of 3% reservation of seats in educational institutions as provided in Section 39 of the Disabilities Act, 1995 and Section 32 of the Disabilities Act, 2016, and also the “intimately connected” issues of providing proper access to orthopedic disabled persons so that they are able to freely move in the educational institution and access the facilities and making adequate provisions and facilities of teaching for disabled persons, depending upon the nature of their disability, to enable them to undertake their studies effectively. The bench has accepted the suggestions of petitioner’s Advocate Rajan Mani, assisted by Advocate Sija Nair. While the petition originally confined to law colleges, the court extended its coverage by encompassing all educational institutions. The bench touched upon various legal provisions to drive home the point that educational institutions needed to be in sync with needs of persons with disabilities. (i) While dealing with the issue of reservation of seats in the educational institutions, we have already given directions …that the provisions of Section 32 of the Disabilities Act, 2016 shall be complied with by all concerned educational institutions. In addition to the directions mentioned therein, we also direct that insofar as law colleges are concerned, intimation in this behalf shall be sent by those institutions to the Bar Council of India (BCI) as well. Other educational institutions will notify the compliance, each year, to the UGC. It will be within the discretion of the BCI and/or UGC to carry out inspections of such educational institutions to verify as to whether the provisions are complied with or not. (ii) Insofar as suggestions given by the petitioner in the form of “Guidelines for Accessibility for Students with Disabilities in Universities/Colleges” are concerned, the UGC shall consider the feasibility thereof by constituting a Committee in this behalf. In this Committee, the UGC would be free to include persons from amongst Central Advisory Board, State Advisory Boards, Chief Commissioner of State Commissioners appointed under the Disabilities Act. This Committee shall undertake a detailed study for making provisions in respect of accessibility as well as pedagogy and would also suggest the modalities for implementing those suggestions, their funding and monitoring, etc. The Committee shall also lay down the time limits within which such suggestions could be implemented. The Expert Committee may also consider feasibility of constituting an in-house body in each educational institution (of teachers, staff, students and parents) for taking care of day to day needs of differently abled persons as well as for implementation of the Schemes that would be devised by the Expert Committee. This exercise shall be completed by June 30, 2018. Before issuing the guidelines, the bench dealt extensively with various aspects of the subject including section 39 of the Disabilities Act which provides for all government educational institutions as well as other educational institutions which are receiving aid from the Government to reserve seats for the benefit of persons with disabilities, which reservation shall not be less than 3%. Thus, 3% of the seats is the minimum reservation and it can be even more than 3%. “It hardly needs to be emphasised that Disabilities Act is premised on the fundamental idea that society creates the barriers and oppressive structures which impede the capacities of person with disabilities. Capability theorists like Martha Nussbaum are of the opinion that there cannot be a different set of capacities or a different threshold of capabilities for persons with disabilities. This raises the critical issue of creating a level playing field whereby all citizens to have equality of fair opportunities to enable them to realise their full potential and experience well-being,” the bench observed. It said to ensure the level playing field, it is not only essential to give necessary education to the persons suffering from the disability, it is also imperative to see that such education is imparted to them in a fruitful manner. That can be achieved only if there is proper accessibility to the buildings where the educational institution is housed as well as to other facilities in the said building, namely, class rooms, library, bathrooms etc. Without that physically handicapped persons would not be able to avail and utilise the educational opportunity in full measure. The apex court commented on the social model of disability which says disability as being socially constructed through the creation of artificial attitudinal, organisational and environmental barriers. “We may add that a basic underline assumption, which is well recognised, is that everyone can learn; there is no such person as one who is ineducable; and that, accordingly, all disabled persons (from whatever disability they are suffering) have right to get not only minimum education but higher education as well. Not making adequate provisions to facilitate proper education to such persons, therefore, would amount to discrimination,” it said. “A disability is only actually a disability when it prevents someone from doing what they want or need to do. A lawyer can be just as effective in a wheelchair, as long as she has access to the courtroom and the legal library, as well as to whatever other places and material or equipment that are necessary for her to do her job well. A person who can’t hear can be a master carpenter or the head of a chemistry lab, if he can communicate with clients and assistants. A person with mental illness can nonetheless be a brilliant scholar or theorist,” the bench said. In the footnotes, it mentioned, “We have a celebrated examples of John Nash, a noted mathematician who earned laurels by getting noble prize, and Stephen Hawkins”. The bench referred to the Higher Education for Persons with Special Needs (HEPSN), which has three schemes, including Establishment of Enabling Units for differently-abled persons. The second component includes providing access to differently-abled persons for which the bench noted that the UGC had agreed to make a one-time grant of up to Rs.5 lakhs per college during the Plan period. The third component deals with providing special equipment to augment educational services for differently-abled persons.